Sustainable Landscaping – While “sustainability” may be the buzz word of the new century, managing the landscape as a stable and productive ecosystem that conserves the physical and biological processes occurring on that landscape is the best way to ensure future generations will have the ecosystem services (clean air, water and biodiversity) they need to survive. The links below provide information about how to practice sustainable landscaping and where to see examples of sustainable landscapes. 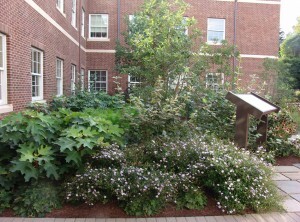 Sustainable landscape at UD’s Visitor Center. Sustainable Landscapes – This website provides detailed information about the role of soil, water, plants, landscape materials and human involvement in developing and managing sustainable landscapes. Sustainable Landscapes on UD campus – Take this virtual tour to see examples of sustainable landscapes on the University of Delaware campus. Plants for a Livable Delaware Series – This series of brochures were developed to educate Delawareans about the problem of invasive plants in the landscape. Plants on the Delaware Invasive Species List that are still bought and sold in the nursery and landscape industry are highlighted in “Plants for a Livable Delaware” and at least 10 alternative plants are suggested to replace the popular invasive plant found in many home landscapes. Control recommendations for removing troublesome invasive plants are covered in “Controlling Backyard Invaders.” In “Livable Plants for the Home Landscape,” plant combinations are suggested that fill specific landscape niches, such as forest edges, sunny slopes and small garden spaces. Finally, “Livable Ecosystems: A Model for Suburbia” shows how to plant and manage rain gardens, meadows, forests and other landscape plantings that provide valuable ecosystem services. The DNLA, Delaware Department of Agriculture, and the University of Delaware Cooperative Extension have worked together to develop a list of nurseries who provide native plant material to Delawareans. Click Native Plants – Wholesale Only Nurseries for a list of Nurseries serving Wholesale customers only. 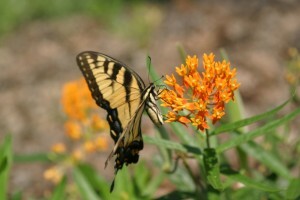 Click Native Plants – Retail / Wholesale for a list of Nurseries serving retail/wholesale customers. Delaware Livable Lawns – The Livable Lawns Program certifies lawn care companies that follow environmentally-friendly practices in fertilizer application while educating property owners. A brochure is available to print and leave with customers to explain proper lawn management. Videos on the Delaware Livable Lawns website provide resources to show homeowners how to take and interpret a soil sample; and how to properly apply fertilizer to their lawns. Livable Lawns: Managing a Healthy Lawn – is a new publication funded by this program.